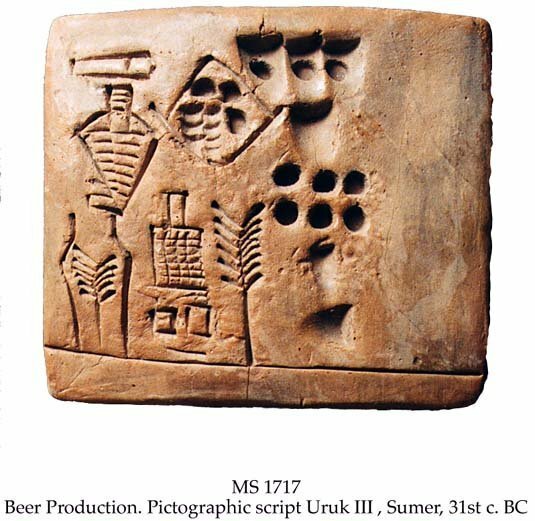 Description	 MS in archaic Sumerian on clay, Uruk, Sumer, 31st c. BC, 1 tablet, 6,8x7,2x1,9 cm, 1 compartment of text in an expert pictographic script Uruk III. Binding	 Barking, Essex, 1997, green quarter morocco gilt folding case by Aquarius. Context	 From a single archive of 77 pictographic tablets including fragments, all in the same hand, of which 25 tablets and all the 30 fragments are in Freie Universität Berlin collections, 4 tablets in British Museum, 3 in Metropolitan Museum, 4 in Louvre, and 6 in The Schøyen Collection (MSS 202, 234, 1710, 1711, 1717, 1894). Commentary	 The present tablet is a masterpiece of pictographic calligraphy. It has just been discovered that 2 hitherto undeciphered pictograms, one like a brick building with a chimney, and the other an ear of barley drawn within a jar or container, illustrates the actual brewing process. Read from right to left we have first the barley delivered, then the brick- building that might be the brewery itself (also with other meanings), and the barley within a jar is the beer. It thus is the earliest representation in history of an industrial process. Published	 John Curtis, ed. : Early Mesopotamia and Iran: Contact and Conflict 3500-1600 BC; in: Proceedings of a Seminar in memory of Vladimir G. Lukonin. British Museum Press, pp. 28, 64. Hans J. Nissen, Peter Damerow, Robert K. Englund: Archaic Bookkeeping; Early writing and techniques of Economic administratiion in the Ancient Near East. Chicago and London. University of Chicago Press, 1993., pp. 36-37. Lars Alvegård: Arkaisk babylonsk matematik: Talpjäser och lerbollar; in: Teknik & Naturvetenskap. Göteborg. 1994, no. 2, pp. 38-40. Exhibited	 1. Museum für Vor- und Frühgeschichte, Berlin 1990, Cat. Nissen/Damerow/Englund: Frühe Schrift und Techniken der Wissenschaftsverwaltung, no. 4.29, pp. 20, 24 and 66-67. 2. Conference of European National Librarians, Oslo. Exhibition Sept. 1994. 3. "Preservation for access: Originals and copies". On the occasion of the 1st International Memory of the World Conference, organized by the Norwegian Commission for UNESCO and the National Library of Norway, at the Astrup Fearnley Museum of Modern Art, Oslo, 3 June - 14 July 1996. 4. The Bibliophile Society of Norway's 75th anniversary. Bibliofilklubben 75 år. Jubileumsutstilling Bok og Samler, Universitetsbliblioteket 27.2 - 26.4.1997. 5. Tigris 25th anniversary exhibition. The Kon-Tiki Museum, Oslo, 30.1. - 15.9.2003.